Firebase Cloud Messaging (FCM) is a cross-platform messaging solution that lets you reliably deliver messages and notifications at no cost. Using FCM, you can notify a client app that new email or other data is available to sync. You can send notifications to drive user reengagement and retention. For use cases such as instant messaging, a message can transfer a payload of up to 4KB to a client app. HOW TO SEND IMAGE IN PUSH NOTIFICATION ? An FCM implementation includes an app server in your environment that interacts with FCM via HTTP or XMPP protocol, and a client app. Additionally, FCM includes the Notifications console, which you can use to send notifications to client apps. Firebase Notifications is built on Firebase Cloud Messaging and shares the same FCM SDK for client development. For testing or for sending marketing or engagement messages with powerful built-in targeting and analytics, you can use Notifications. For deployments with more complex messaging requirements, FCM is the right choice. Set up the FCM SDK Set up Firebase and FCM on your app according the setup instructions for your platform. Develop your client app Add message handling, topic subscription logic, or other optional features to your client app. During the development, you can easily send test messages from the Notifications console. Develop your app server Decide which server protocol(s) you want to use to interact with FCM, and add logic to authenticate, build send requests, handle response, and so on. Note that if you want to use upstream messaging from your client applications, you must use XMPP. If you haven’t already, add Firebase to your Android project. Apps that rely on the Play Services SDK should always check the device for a compatible Google Play services APK before accessing Google Play services features. It is recommended to do this in two places: in the main activity’s onCreate() method, and in its onResume() method. The check in onCreate() ensures that the app can’t be used without a successful check. The check in onResume() ensures that if the user returns to the running app through some other means, such as through the back button, the check is still performed. If the device doesn’t have a compatible Google Play services APK, your app can call GooglePlayServicesUtil.getErrorDialog() to allow users to download the APK from the Google Play Store or enable it in the device’s system settings. For a code example, see Setting up Google Play Services. On initial startup of your app, the FCM SDK generates a registration token for the client app instance. If you want to target single devices or create device groups, you’ll need to access this token by extending FirebaseMessagingService and overriding onNewToken. After you’ve obtained the token, you can send it to your app server. See the Instance ID API reference for full detail on the API. Once the client app is set up, you are ready to start sending downstream messages with the Notifications composer. Install and run the app on the target devices. Select the message target. The dialog displays further options to refine the target based on whether you chooseApp/App Version, Device Language, or Users in Audience. After you click Send Message, targeted client devices that have the app in the background receive the notification in the system notifications tray. When a user taps on the notification, the app launcher opens your app. If you want to receive notifications when your app is in the foreground, you need to add some message handling logic in your client app. Notifications delivered when your app is in the background. In this case, the notification is delivered to the device’s system tray. A user tap on a notification opens the app launcher by default. Messages with both notification and data payload. In this case, the notification is delivered to the device’s system tray, and the data payload is delivered in the extras of the intent of your launcher Activity. If you want to open your app and perform a specific action other than the default action, set click_action as described below. This includes messages that contain both notification and data payload. In these cases, the notification is delivered to the device’s system tray, and the data payload is delivered in the extras of the intent of your launcher Activity. Firebase Cloud Messaging (FCM) offers a broad range of messaging options and capabilities. To help you build an understanding of what you can do with FCM, this page lists and describes some of the most commonly used message options. Many of these options are available only through the Firebase Cloud Messaging server implementation. For the full list of message options, see the reference information for your chosen connection server protocol, HTTP or XMPP. How to find Firebase Api key ? 1- Go to Firebase Console. 3- Then go to Project Setting. 4- Click Cloud Messaging tab and Copy Server Key. I received below error after 1 min of closing app. and no notification received by device. Can you show me your integration on facebook or whatsapp? how many device will support fcm is it free of cost? fcm is free for lifetime and unlimited devices. this is MainActivity. Sorry for missprint. Check your IP address or MySQL connection. maybe your password of MySQL connection is wrong. yes, you can run in real android device. only change your IP address in RegisterActivity.java for connecting your device to wamp server. this tutorial has for separate login user and also save their device’s id (token) to MySQL database. test with different email ids and if you getting any problem then comment here. I’ll help you. nice Tutorial Sir! code works fine but when clicking on notification , it show nothing on app screen activity. Hi. If I wanted the server to send push notifications automatically when a new row gets added in the databse, what changes do I make? Please help me out. add send notification method to your insert row function. This tutorial is based on Android. So please visit below link for iOS. clean your project and try again. This works only if apk is installed directly from Android studio. When I send the app to another phone this doesn’t work, please help. Uninstall your application then install again and check application log for registration values. i’m getting error like ” java.lang.NullPointerException” in Register Activity. connect your device with internet connection because your fcm id didn’t generate. Hello Akhsay, I want to send notification from one device to another using fcm .i saw many tutorial but it always show me tutorial in which we send notification from fcm console . Can you please help me in developing app server by using xmpp, I wanted to use xmpp in my app server bu I am not getting any clue, I have gone through XMPPHP, JAXL libraries but not getting how to do it. Hi. thanks for the tutorial. Can you help me send notifications from mysql database (where images are added) to android app when new rows are added to my table? add below code to your admin panel for saving data to mysql table. 1)how can i fetch id in frament??? 2)how can i migrate into fragment from notification rather than activity??? those files are same as u have iam just copying Token from log and paste in my DB,and then accesing same token from admin panel,even though i will send ma project. Send your android studio project files. bro i did everything even i replace whole code even though its not working,nd new error whenever am tryng to get token in any other acivity such as in my app register activity its crashing ma app! !plz help am frusted now,i wasted 3 days in this even though its working!! We developed a web projects so any what ever registered users in that project we can send push notifications , this is not a android app could you please help me. how to send push notification web to web ? check your internet connection and test again. Error:Failed to complete Gradle execution. how to rectify this error ???????? how is it possible bro? Yes… You can send a message between device to device and web to device and device to web. Image not showing in notification if app in the background maybe this is a bug in girebase and you can use bundle to send your image to activity. If i find any solution of this problem i will post here. Please See this.. I am not get solution yet. Hello Akshay, I have stuck in issue that everyone gives tutorial of pushnotification but he is not given any detail code after that issues. my issues is that i want to go under 4th activity when i click notification with some value which is need of my 4th Activity.. i did not , how to use getintent().getExtra() and any other solution. when my app in background i click the notification but it comes from splash screen.. please help me..
It’s all set. I have exactly the same code as you have provided. But only question is..
How to set notification sound when the app is in background? However notification sound appears while app is running foreground. p.s. it would be great if you provide tips for vibration too. 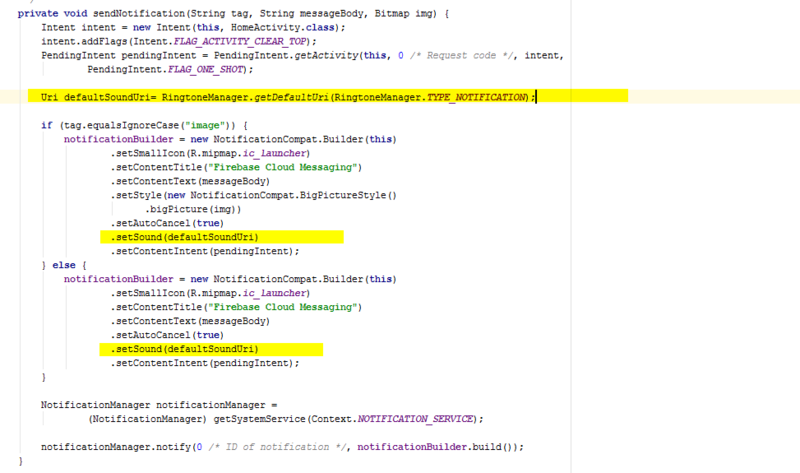 I already manage to send notification message from php file and send to mobile phone using fcm. Once the user click on the notification message on mobile tray, it will redirect to other layout with same message plus time and date…is it possible to do that…? Do you have any code that once I received notification to my System tray (mobile phone), how to pass these message to my Activity (New Screen Layout) so that I can see more clear the notification text is all about. Raj , from some reason the defalt ringtone is not working for me , this is my code, what i am doing worng , i try also to use a ringtone from my resource and it’s doesnt work for me also. It is inside private void showNotification(Stringe message) method..? how to create beep sound when the notification is arrived to our mobile phone..? do you have the coding & where to put it..? on Php file or in MyFirebaseMessagingService.java..
check this line .setSound(defaultSoundUri) in MyFirebaseMessagingService.java file. and put your sound file (message.mp3) to "res/raw/"
Hello,I am sending notifications to the android devices using FCM, Now I want to send the notification to android & Ios at a same time & to the intended devices only, can you help me on that?? I want to start a new activity when user taps the notification. How to do it? services are also in place..
E/GcmReceiver: Error while delivering the message: ServiceIntent not found. When app in background, is there any way that i can catch the push notification and modify notificaiton settings ( for example : add image, change notification style, sound). I remember GCM allow you to do that. I also working on it because fcm showing only message if app in the background. Please Inform Me What to do in server side files please Help me i m newbie in android . I updated all files. You can build with all source code. may i know what changes you made now??? Thanks for Great Tutorial on PushNotifications ! 2. when the app is running state image is coming (good)..but when i send only text push without image..text is not coming but showing blank_space in the place of image..
i executed the exact code !! can you please check it out ?? Hi Thanks, this code is working on my device. But I got some bugs, when I push FCM to my app (on background) the small icon will show white (this use launcher from manifest). But when I open the app, the icon is correct using my drawable. Can you help me? I didn’t understand. Can you send me screen shot to my email or facebook? How to set notification sound when the app is in background?? Error:(17, 0) SDK location not found. 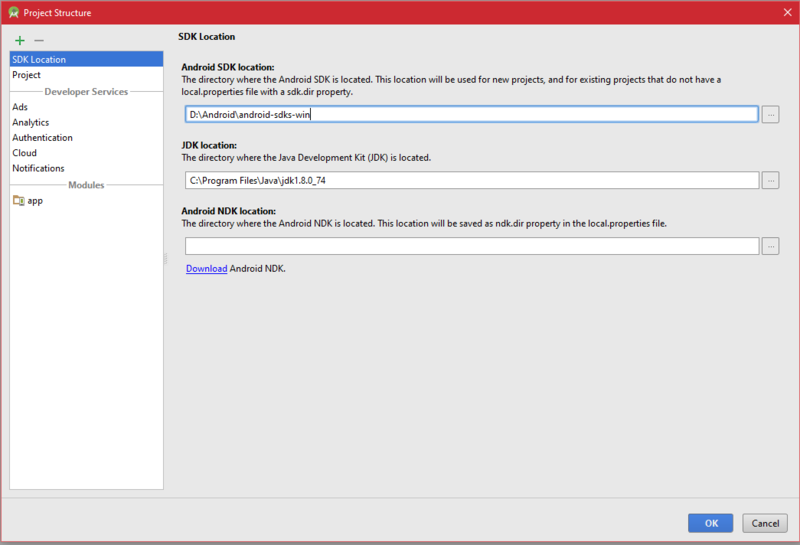 Define location with sdk.dir in the local.properties file or with an ANDROID_HOME environment variable. The notification is not showing when the app is in the background, trying to look for the solution, but they are all for expert (just explaining without showing how to do it). Can you please help me? Thank you! use my source code. it’s working if app running in background. What is “fcm_id:” ? at “register.php” ? fcm_id is a Firebase Registration Id. Firebase Registration Id is automatically generate when you integrate firebase in your android project. more info about fcm id. Thanks boss, did you any tutorial for that, or can you do one for us please ? This is my Android Push Notification post. you can make an admin panel from here. Hi, how to send notifications from website to Android apps ? Is it possible ? Yes, It is possible. You can make an admin panel for sending notification. 07-15 07:28:54.867 2368-2368/akraj.snow.fcm D/FirebaseApp: Notifying background state change listeners. Why it is not the php file in the server?